The FCT High Court sitting in Gudu, Abuja has found the former Plateau State Governor, Joshua Dariye guilty on 15 count charge of corruption. 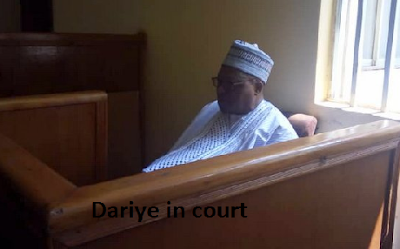 Mr. Dariye was found guilty on count 1,2,3,4,5,6,7,8,10 while not guilty on county 14, 16, 18. On count 17,21,23, Mr. Dariye was found guilty as charges for breach of trust and on count 3, 9,11,22 for criminal misappropriation of funds he was guilty as charged.